The e-book already has about 30.000 downloads and is written by Microsoft MVP´s. 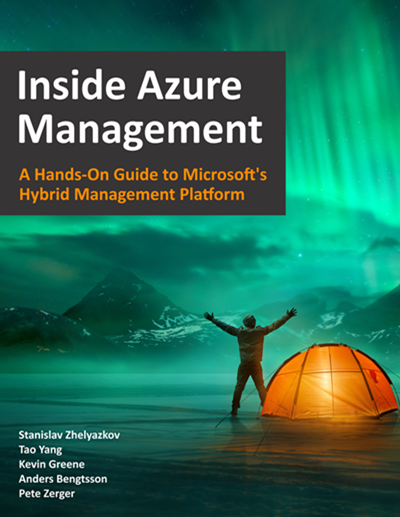 "Inside Azure Management" can be downloaded at Free Book: Inside Azure Management v3. The latest version download is located at gallery.technet.microsoft.com. As mentioned in the document, Azure provides hundreds of different resource types to consume. This e-book guides Azure administrators to explain the key aspects and features of Azure for managing their workloads efficiently. Authors are the Microsoft MVPs Tao Yang, Stanislav Zhelyazkov, Pete Zerger, and Kevin Greene, along with Anders Bengtsson of Microsoft. Code samples are available on Github at insidemscloud/InsideAzureMgmt. Many thanks to the passionate authors who make this cool e-book available for free!